I’m dreaming of a really lush vegetable garden for my backyard this summer. Today my daughter, the Kitchen Designer, is coming over to design some raised planters for my backyard. The girl works miracles with a tape measure, pencil, and paper. She says she’s leaving the dirty work for her Mom. Just beyond these stone walls there are two large rectangular plots in a warm sunny southern location. The trees and roses are gone now and that barren space taunted me last summer! Daring me to make something of it. Do you watch The Barefoot Contessa on The Food Channel? I covet her Herb Garden. Honestly I covet just about everything in her fabulous Hampton Wonderland. I’ll have to settle for the Herb Garden. One entire planter devoted to herbs. Starting with Thyme, Basil, Sage, Lemon Balm, Parsley, Chives, Oregano, and Cilantro. They’re the best excuse for cream cheese since cheesecake. Sweet juicy melons can spread out and spill their leaves over the raised edges while carrots, onions, and lettuce line up in tidy rows like Madeline and her little French classmates. 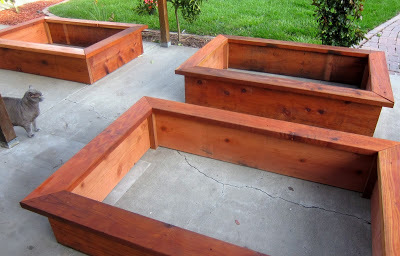 I want wood planters like these. There’s a BLT in my future made with my very own heirloom tomatoes. So I’m marking my calendar and snapping some BEFORE photos. On a hot July day I’ll sit on the patio and survey the fruit of my labors while the sun and soil do what God intended and crank out more food than we can eat, preserve, and give away. Do you have a favorite variety of vegetable or fruit you plant in your garden? I’d appreciate any suggestions, it’s been years since I last had a garden.